Hi all! I'm happy to share my latest quilt Windmill. 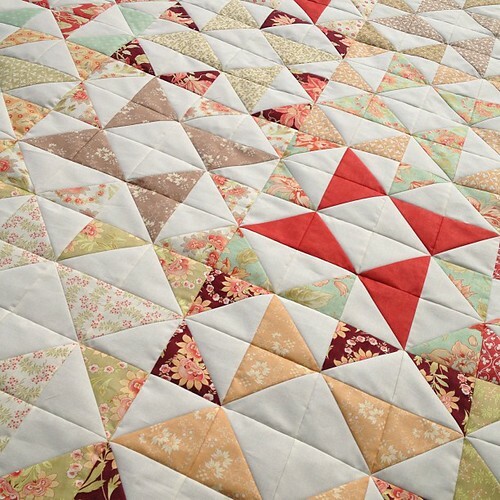 You can also find a tutorial for this quilt on the Moda Bake Shop today. I designed this one for a cousin who is getting married in August and I am actually delivering it to her at the bridal shower today :) The colors in this Tapestry line by Fig Tree & Co. are so gorgeous and I think they will fit nicely in the newlyweds home. The blocks were a lot of fun to make and when I put them all together, I just fell in love with it! I have a feeling I will be making this quilt again in different fabrics and probably even bigger. As it is with 16 blocks, it measures 64" square. I tried a new free motion quilt method on this quilt. It is a leaf type design (I guess!) and although it is FAR from perfect, I think it looks nice now that it is all washed, dried and crinkly. Thanks to all who requested a tutorial on this block! Moda agreed and were happy to publish it on their blog. I'm such a lucky girl and so blessed to have wonderful supporters in all of you. Let me know if you have any questions about the tutorial and I will be happy to help you out. This makes completed quilt #8 for 2013!